You might know that I'm looking for a PDA or similar device that will allow me to comfortably check and write emails, write blog posts and visit websites while on the road. I do have a Toshiba notebook but I don't like to use it on the road. It is fine in hotels and on conventions where I can use it stationary but it really is to big to work comfortably with while walking around. A friend of mine told me about the Asus EEE PC which is a subnotebook with an 7 inch screen, a 900 Mhz Intel Celeron M cpu, 512 Megabyte of Ram and a 4 Gigabyte Solid State Disk. This is not a notebook that you can use to play games or big applications but it could be ideal for my situation for several reasons. It comes with a keyboard which is definitely a plus over those PDAs that I looked at. Sure there are external keyboards for those PDAs but it would mean that I would have to carry that around as well. A 7 inch screen is much nicer than the screens that the PDAs use. 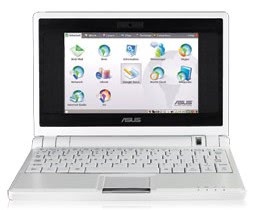 Another advantage of the Asus EEE PC is the price of €299 and the Linux operating system. Future versions will also see Windows XP as the operating system of choice. The EEE PC boots Linux in 15 seconds which can be attributed to the Solid State Disk drive. The RAM can be pumped up to a total of 2 Gigabytes of RAM and another Solid State Disk can be added to the Asus EEE PC as well. What I do not like that much is that the battery will not last for more than 3.5 hours according to Asus. Reviews of the Asus EEE PC complained about the tiny keyboard and the low res display as well. I guess I have to test on before I make a decision. The biggest turnback is the battery power of the EEE PC though. The tiny (or rather, low-res) display is exactly the reason why I’m not very interested in the Eee. I’d much rather have an XO (OLPC). In monochrome mode – which is fine for most tasks – it has an impressive resolution of 1200×900 (800×600 otherwise). I’m actually writing this on an Eee PC. The small screen and low resolution is probably the biggest drawback. But the 900MHz processor is surprisingly zippy when using the built in Xandros Linux distribution. You can also very easily install Windows XP or other operating systems. As for the battery life, an extended battery would make the Eee PC larger and heavier, which partially defeats the purpose of having a tiny portable take-anywhere PC. The power cable, on the other hand, is tiny. It’s more like a cellphone charger than a laptop charger, which makes it easy to take with you. I was looking into the EEE for several months now, and am quite fond of it. The battery life is a drawback though, but keep in mind that the power supply is only as big as a regular cell phone charger, so there’s no problem taking it along. Because of the size, it will fit nicely into your bagpack or suitecase. Additionally, depending on your use of the EEE, the battery may last longer than 3,5h. I have a full-sized asus notebook myself, which should last about 3 to 4 hours, but with a little tweaking, i get it to 5 hours of office work. I have had the eeepc for a few weeks now and adore it. I often leave the macbook in the bag when going into the coffeeshop, even for periods of up to a couple of hours (so, I like hanging out in coffeeshops…). Yes, I wish the battery lasted longer — can sit at the coffeeshop for upwards of FIVE with the macbook — but it’s hardly a deal breaker. And the screen is NOT a problem. Writing in Abiword fullscreen mode is very easy on the eyes. Web-browsing in Firefox requires occasional sideways sliding of the window/scrollbar, but the arrow keys do that easily and as you may notice even from this blog-page, most sites are actually designed almost perfectly for a 7″ screen. Yes, the font is small in Firefox, but even that’s adjustable, if your eyesight is poor. As for getting the XO instead? Forget it. Mine (ok, ostensibly it’s for my son, age 5 1/2) arrived two days ago. I’ve yet to get it online, the keyboard’s miserably small and slick, and it’s hardly intuitive. It has much that is appealing about it, but the eee is smaller with better screen and keyboard and really amazing ‘net connectivity. The XO’s mesh networking is great in concept but until I can actually get it to use one of the myriad wifi locations it sees to get online, it ain’ impressing me much. Add to this that the eee’s OS is a relatively open version of Xandros, easily modified (or even replaced) vs. the XO’s highly proprietary Fedora implementation with the odd Sugar interface and your decision should be clearer. Given that everyone expects Asus to release their 6-cell battery soon and the XO feels like an alpha or beta-quality product (my ancient eMate feels sturdier and has a TOUCH screen), I believe you’d be very unhappy if you went with the XO over the eeepc. Thanks, gyffes, I appreciate the extensive information! That might make me reconsider (especially with regard to future enhanced versions of the Eee), but given that neither the XO nor the Eee is available over here yet … well, we’ll see. Right, well, since you’re still undecided… might as well wait to see what Steve announces at MacWorld in January. I really bought the eee to tide me over ’til Apple’s eMate-replacement device (10″ clamshell lappie, SSD, in the $1000-1200 range is my hope hope hope). I’m still eager to see what Apple will release but the Asus has me very very satisfied in the ultra-portable computing department. Especially now that I’ve tweaked the KDE interface so I see nothing but the keystroke-activated application launcher. I expect there to be a lot of new developments in this particular market next year, as a number of companies have already announced plans to produce similar devices. Oh, forgot to come back and add: I’d had the XO about 3 days when I came in to work one morning and found it dead dead dead. On boot, it’d give me a nice chime, the XO symbol would appear with a single white “snowball” beneath it… and nothing more. Extensive searching yielded several different things to try as fixes, none worked. ALL resulted in “Boot failed” (in red) with a nice yellow frowny face (echoes of Sad Macs past). It’s back in its box about to be RMA’d back to the manufacturer. I’m too experienced a computer user for this to totally sour me on a device — I understand how tech, esp new tech, can fail; I’ve not given up on the XO, but it’s now going to be a BIRTHDAY present for my son, not an xmas present. Still, the experience hasn’t thrilled me and has left me MORE delighted with my eeepc.